Pete’s Candy Store announces the addition of it’s newest bi-monthly series, Classical Candy, to its exciting roster of musical happenings. 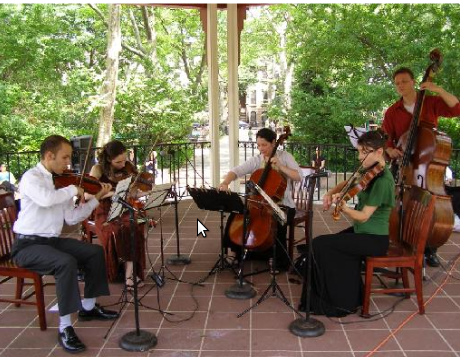 Classical Candy is an after work Thursday gathering featuring performances by some of New York’s finest young classically trained musicians eager to present pieces that represent the truly eclectic, varied, and exciting sound world that encompasses ‘classical’ chamber music. Each evening will be an hour-long exploration of acoustic composed works by various composers from days pre-Bach to works by living composers for a variety of instruments. Experience chamber music as it was originally intended to be enjoyed: in a wonderful intimate space. Every other Thursday from 7:30-8:30 p.m. The Overnight Crossing is Julie Hardy & Mark Dewings; two people who drifted into NYC to make music, though never expected to make music with each other. With a unique style that can only be described as ‘indie folk chamber music’, they’re influenced as much by Schumann as Simon & Garfunkel, by Bon Iver as much as the Beatles. Their backgrounds are as varied as their sound: one conservatory trained musician, one musical hack; one American, one European; one girl, one guy.